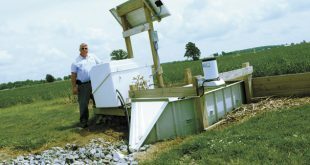 The OLICA drainage project at the Farm Science Review included new technology that has numerous benefits for yield and water quality. 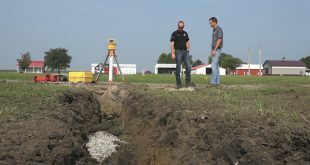 Now is the time to start checking your existing agricultural drainage system for any field conditions that may need your attention after the last crop season and certainly after the excessive rainfall in 2018. Check drainage outlets for damage or blockage, and clean the animal guard; check the field for drain blowouts or soil failures where excessive runoff and sediment may enter the subsurface drains; check areas that ponded last crop season, or where crop yields were reduced because of excessive rainfall and soil wetness to assess the need for additional drainage, etc. You may be considering new subsurface drainage or replacing parts of older systems. When considering a new system, you might want to think about an alternative system design, a Drainage Water Management System. 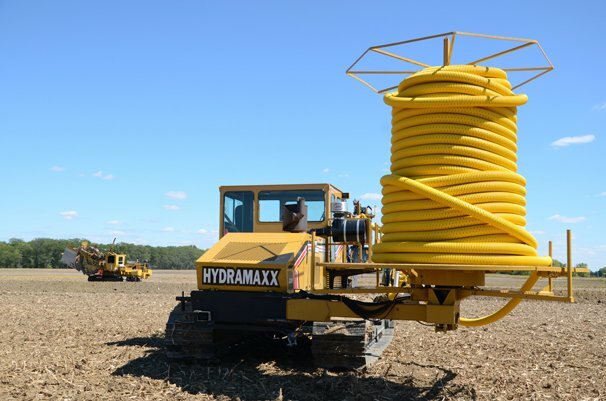 All of the benefits that come with a traditional subsurface drainage system can be achieved with a system that is designed for drainage water management, plus at least several important extras. Drainage Water Management (commonly called controlled drainage) provides improved water quality benefits. Recent research from across the Midwest shows that with drainage water management, annual nitrate-nitrogen loads can be reduced by as much as 50%. A similar result might be possible for soluble phosphorus, but more research is needed. In addition, Ohio research suggests crop yield increases of 3% to 4% are possible, on average, and maybe more in certain cases in some years. Some of this crop yield increase may be attributed to some saving of drainage water in the soil profile for plant use. Drainage water management systems may differ from traditional subsurface drainage systems as follows: 1) drainage laterals are installed on or near contour; 2) a water control structure is installed at the drainage outlet; and the outlet elevation can be raised to retain some of the drainage water, and lowered to allow excess drainage water to be released; and 3) system layout may be designed to optimize drainage water retention by constructing water management zones, each with a separate water control structure, and with new or replacement systems, installing the drainage laterals more along the contours of the landscape. Of course, there may be other differences. Want to know about the pros and cons to each system? Want to know how best to design and layout subsurface drainage systems, as well as design, layout and management drainage water management (controlled drainage) systems? Consider attending the 2019 Ohio State University’s Overholt Drainage School. The 2019 school will be held March 18-21 in Paulding County. This four-day school will cover: 1) Subsurface drainage: design, layout and installation; benefits and impacts; 2) Drainage water management (Controlled drainage), design, layout and installation, management, and benefits; and 3) Drainage water harvesting for agricultural water supply; and a summary of water quality improvement practices (BMPs) that fit well with drainage water management systems. These practices include: woodchip bioreactors, phosphate filters, improved blind inlet construction, saturated buffers, and others. 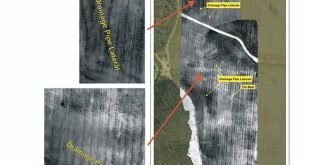 The Overholt Drainage School is an intensive course and is open to anyone interested in advancing their knowledge of basic concepts, principles, and skills related to the purpose, design, layout, construction, and management of soil and water conservation systems, with emphasis on agricultural water management and water quality. The School is sponsored by the Overholt Drainage Education and Research Program, the Food, Agricultural and Biological Engineering Department, OSU Extension, Paulding County Extension, OARDC, the College of Food, Agricultural, and Environmental Sciences, The Ohio State University, in cooperation with the USDA-NRCS, USDA-ARS, Soil and Water Conservation Districts, Ohio Land Improvement Contractors and Associates, and others. The Overholt Drainage School has been conducted annually since the mid-1950s. The 2019 School is the 31st. Excellent drainage workshops are also conducted in Illinois, Iowa, Missouri, Minnesota, North and South Dakota. For more information, please contact Larry C. Brown at 614-292-3826 or brown.59@osu.edu. Dr. Larry C. Brown, Professor and Extension Agricultural Engineer, can be reached at 614-292-3826, or brown.59@osu.edu. This column is provided by the OSU Department of Food, Agricultural and Biological Engineering, OSU Extension, Ohio Agricultural Research and Development Center, and the College of Food, Agricultural, and Environmental Sciences. 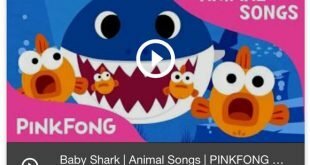 What do you get when you cross Queen, a Baby Shark and a school bus? How much are the classes. Do they have video. We get alot of drainage. Looking for ways to store and release. Never done drain tile so no clue on depth ect. Have the equipment to survey and excavate. Fruit trees vineyard are of concern too. Hello Mr Hager, please contact me via my email or phone (shown in OCJ article), and I will share information with you. Also, I can email the announcement and registration if I receive your email address. We focus primarily on cropland (growing corn, soybean, wheat, vegetables, etc. ), but the design concepts are the same for vineyards, except for specific attention to drain spacings (I can visit with you individually on this issue).